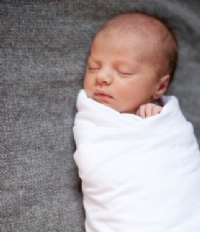 What exactly is swaddling? According to sleep consultant Angelique Millette, Ph.D., it refers to any number of ways in which to wrap a baby in a blanket, so that his arms and/or legs are securely held. "The swaddle can facilitate better sleep for newborns since it can reduce the likelihood that the startle reflex will wake them," she explains. Jessica Linnell, author of The Complete Guide to Helping Your Baby Sleep Through the Night So You Can Too: 101 Tips and Tricks Every Parent Needs to Know (December 2010, Atlantic Publishing), likens swaddling to a baby burrito. "The main point of swaddling is that it mimics the feeling of being inside the womb," she says. "It may ease the transition from the womb to the outside world." Aside from the warm, cozy feeling it affords, swaddling actually offers tremendous health benefits. Millette points to numerous studies demonstrating that swaddling helps babies sleep better and fuss less, as well as its role in reducing the risk of Sudden Infant Death Syndrome (SIDS). As soon as you are ready to give swaddling a go, your baby is most likely ready, too. In fact, says Linnell, you can begin shortly after birth. "Nurses will swaddle your baby as soon as they've done all their weights and measurements," she adds. Millette recommends waiting until a baby is between 3-6 months—but not after 6 months—and to remove the swaddle once a baby starts rolling to the side or on his tummy. She also advises against swaddling once a baby is active enough that, when swaddled, they are able to free their hands. "Doing this can easily move the swaddle over their face," she says, which is a definite no-no. Before you're ready to begin, make sure you have the proper blanket. Linnell found that hospital blankets work best and suggests checking with the nurses before discharge to see what their policy is about taking some extras home. "You don't want any material that is too hot, so cotton is a good choice," she notes. "Make sure that the blanket is big even to tuck the extra in tightly, so your baby is snug and doesn't wiggle out easily." After laying out a blanket on a flat surface, fold down the top-right corner and place your baby on his back with head on this folded corner. Next, pull the corner near your baby's left hand across his body, and then tuck the edge under his back on the right side under his arm. After pulling the bottom corner under your baby's chin, bring the loose end over your baby's right arm and tuck it under the back on his left side. Be advised that swaddling has its risk factors, such as overheating and overwrapping. "Parents tend to worry that their baby may be cold at night, so they overdress them," observes Millette. "Babies' thermostat is at the nape of their neck, so slide your palm across it to see if it's too moist." Linnell employs basic common sense when practicing swaddling. "Many times you can have your baby in just a onesie underneath the swaddle," she notes. "Also, don't get the swaddle so high that it would interfere with breathing," she adds. As far as swaddling too tightly is concerned, Millette says there is a right and a wrong way. "While babies prefer to be swaddled tightly, it's important that the hips are free to move and flex," she notes. The same goes for baby's hands. "If they are tightly swaddled at the hips, they can't use their hands to soothe and settle," explains Millette. Instead, swaddle in a hands-up position. While the initial idea of swaddling may seem daunting at first, realize it takes some getting used to. "Get plenty of lessons before you leave the hospital," offers Linnell. "Newborns can be swaddled while awake or asleep, so there is plenty of opportunity to learn. Take advantage of the nurses' knowledge and help—I would even call them in and have them show me how to swaddle." And as always, trust your instincts and pay attention to your baby's cues. "If your baby doesn't respond well to swaddling, don't force the issue," adds Linnell.